Ground broken for new Piper fire station – Welcome to Wyandotte Daily! 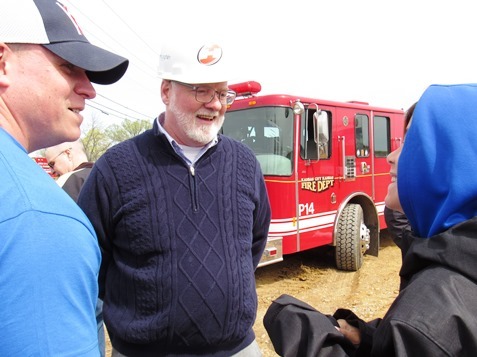 After about five or six years of diligently working for a new fire station for Piper, Commissioner Mike Kane saw his project move forward in a big way on Saturday morning. Ground was broken for new Piper fire station No. 12 at 2913 Hutton Road, which is near 107th and Leavenworth Road in Kansas City, Kansas. Kane, the 5th District commissioner, said at the event that he had started bringing up the need for a new Piper fire station when he was first elected about 14 years ago, but that for a long time, he couldn’t get anyone to listen. Piper had a former township fire station that was known as a “pole barn” near 123rd and Leavenworth Road, he said. He had his own medical episode about a year and a half ago with a need for an ambulance, and that “put the fire under me,” he said. The UG commissioned a study that indicated a need for two fire stations in the Piper area. 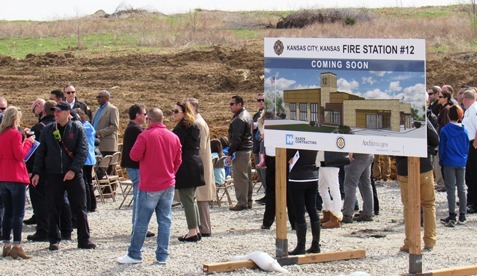 It also indicated a need for many other new or renovated fire stations throughout Kansas City, Kansas. A couple of years ago, there was some opposition to Kane’s idea to build the Piper fire station first, as some of the administration thought the building of new stations should be approached together in a plan, instead of one at a time. But, as Kane said today, “We’ve got to start somewhere, and this was the start.” The Piper station is part of the plan, according to officials. “This is the first one, we’re not done,” Kane said. Kane and other officials also thanked John Kelly of the UG buildings and logistics for his work on the project. The new 10,834-square-foot fire station will include two drive-through bays and an ambulance bay, gear decontamination facilities, EMS storage, 10 bunk rooms, a kitchen, dining room, living space and day room, as well as a fitness room, according to information from the Unified Government. The cost of the fire station was expected to be in the $4 million to $5 million range. The contractor is Haren Contracting. Archimages is the architectural and design firm. The new fire station location is just south of Leavenworth Road near 107th. It is fairly close to The Legends Outlets area, which is about 1.9 miles south of the new fire station. To the north, 1.7 miles away, is Piper High School. When asked later, Mayor Alvey said that the question might really be “when,” rather than “where” the next fire station will be, considering financial challenges. Mayor Alvey said while there are plans to construct other new stations or renovate some, the site for the next new fire station has not yet been identified. There are so many fire stations that need work, including a lot of former township fire stations, he added. He said the Turner area needs to be looked at, because some of those older township fire stations don’t serve the firefighters well. Some old stations may have mold or other conditions that are not ideal, he said. Most likely, they will take the worst ones and work them first, he said. Cost has been a factor in getting some of the work done over the years. There also is a continual need to upgrade fire equipment, he added. Commissioner Melissa Bynum, at-large District 1, pointed out that there is senior housing planned for the area around the new fire station. She said the UG had studied the area in a systematic way and did not haphazardly choose this new fire station location. The UG studied the need and listened to residents, she said. The UG tried to align its goal for rebuilding critical infrastructure for what the community needs, she said. Filling the gap in EMS and fire coverage was a critical need, and that’s why they knew this station had to come first, she said. 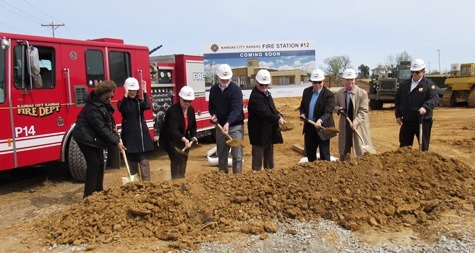 Also attending the groundbreaking ceremony were Unified Government Commissioners Tom Burroughs, Angela Markley, Gayle Townsend and State Sen. Kevin Braun, along with firefighters and UG officials. 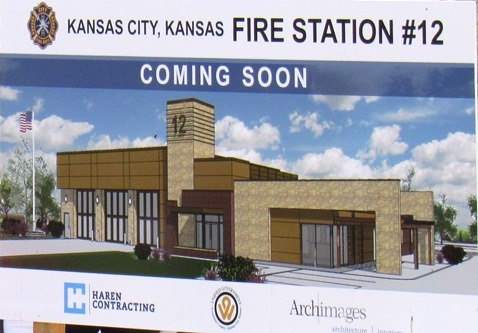 Kansas City, Kansas, Fire Chief Mike Callahan said this will be the first new fire station built in Kansas City, Kansas, in 18 years, and will be the first new station ever for Piper. “This station will incorporate the most up-to-date cancer prevention technology available for the members who are going to be serving in this station,” Chief Callahan said. There is a need for more fire stations in Kansas City, Kansas, he said. He mentioned that Turner is another area that needs work, in new buildings or renovations. Many of the older firehouses were started by townships and were staffed by volunteers who typically didn’t live at the fire stations, he said. Those stations were then consolidated into Kansas City, Kansas. “We’re doing the best we can with what we have,” he said. The firehouses that are not going to be demolished will be rehabbed, he said, and there is a plan for it. There are plans for new facilities, land acquisition and rehabilitation of existing facilities, he said. An architect’s sketch of the new Piper fire station. 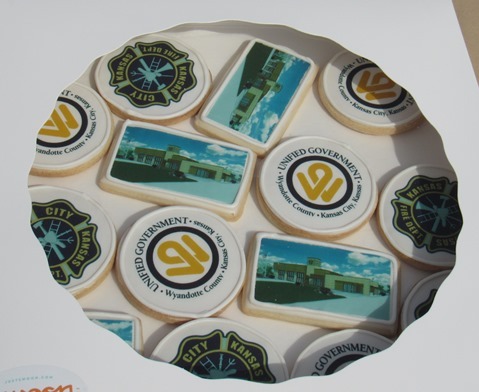 Refreshments included some confections with pictures of the new fire station and logos.